This sweet cream colored soft teddy will be an ideal gift for your dear ones on any occasion.The yellow fur on its feet and ears along with a big brown nose, gives it a very cute outlook. 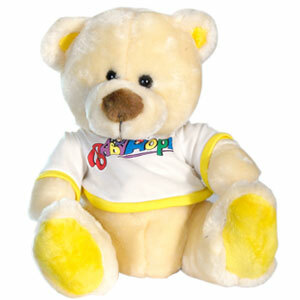 The teddy is also wearing a white T-shirt with yellow lining. With its small beady eyes, it will definitely melt your loved ones heart. So, make your dear one who lives in all cities in India feel cherished by sending him/her this teddy bear. You can also send this teddy along with other Gifts across India through GiftsAcrossIndia.com.